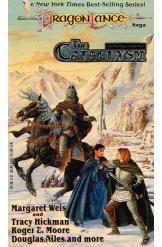 Dragon Lance: The Cataclysm by Margaret Weis and Tracy Hickman, Sci Fi. Book is in good condition, all pages intact. The Kingpriest's arrogance brings the wrath of the gods upon Krynn. The result is the Cataclysm, chaos and anarchy, despair and villainy and inspiring heroism.